There are 17 penguin species on the planet, all of which are confined to the Southern Hemisphere (with the possible exception of the Galapagos Penguin, which lives on the equator). The list has been broken into three distinct regions being 1) Antarctica and sub Antarctica Penguins (8 species), 2) New Zealand Endemic Penguins (4 Species) and 3) Other Penguin Species (5 Species). Warning: To make sense of the below “Difficulty to see” ratings it’s important to note that approximately 85% of people travelling to Antarctica do a “classic” 10-11 day itinerary from Argentina. These itineraries will generally depart from Ushuaia in Argentina, visit the Antarctic Peninsula and then return to Ushuaia. Many of the species mentioned below do not live on the Antarctic Peninsula and even though they may be more populous, they are considered harder to see because travellers need to take a cruise to Sub- Antarctic islands such as South Georgia, The Falkland Islands or Macquarie Island to see them. It’s noted that these cruises are more expensive than a Peninsula cruise, sometimes considerably more. To give an impression of travel numbers to each area, about 40,000 people visit the Antarctic Peninsula each year. By comparison, only approximately 5,000 people visit South Georgia each year and as few as 500 visit Macquarie Island. More remote sub-Antarctic Islands like Isles Crozet, Isles Kergeulen and Heard Island generally have no tourists (or at best one special interest cruise every year or two). The below list of Antarctic and Sub- Antarctic Penguins does not mean that these penguin species only exist within the Antarctica. Some of these penguins also have small colonies or can sometimes be seen in locations such as New Zealand or Southern Argentina. Emperor Penguin: A spectacular looking animal with its colourful yellow plumage. It’s the largest of the penguin family, and by some way. 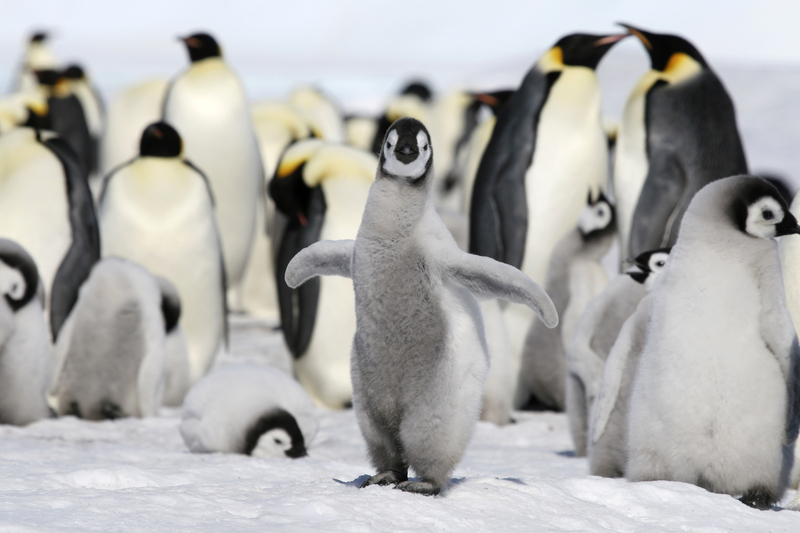 Emperor Penguins can weigh as much as 40kg, which is almost three times as much as any other penguin. The Emperor Penguin is also one of the least common species, with only about 200,000 breeding pairs. King Penguin: The second largest penguin after the Emperor. It is closely related to the Emperor and as both penguins share a bright yellow plumage it is hard for the average layperson to tell them apart (tip both penguins have hour-glass shapes on the side of their heads. The Emperors are mostly white, whereas the Kings are entirely yellow). The Kings are reasonably common with over 1,000,000 breeding pairs. Generally only on sub-Antarctic Islands such as South Georgia, The Falkland Islands and Macquarie Islands. 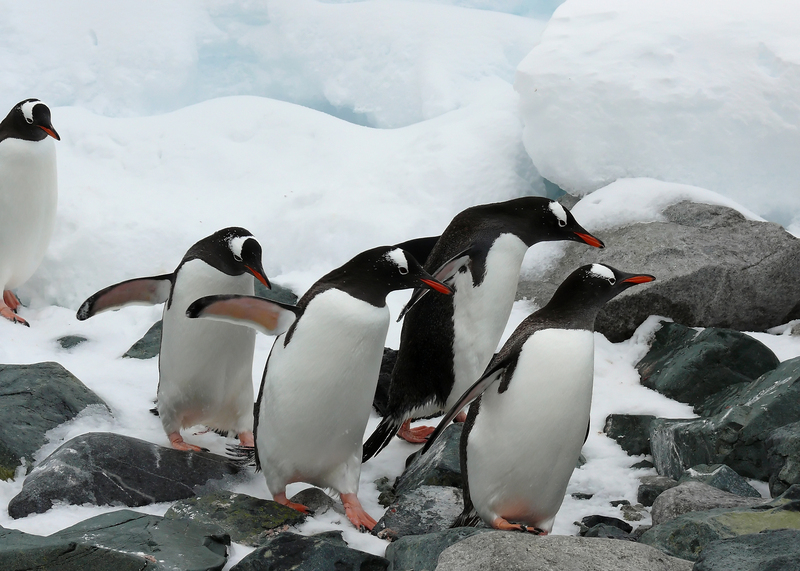 Individuals can sometimes be seen on the Antarctic continent. Adelie Penguin: The archetypical penguin. These guys are small, cute and almost entire black and white. Their big eyes almost look like they are sewn on like a stuffed toy. With an estimated population of about 2.5 million breeding pairs, these are one of the more common penguin species although their numbers are much less than the most common crested penguin species, such as the Macaroni. Adelies are mostly confined to the Antarctic continent during the summer months and can be seen all around the continent. Gentoo Penguin: A little larger than the chinstrap and the Adelie Penguin, this penguin is distinguished by its bright orange beak. 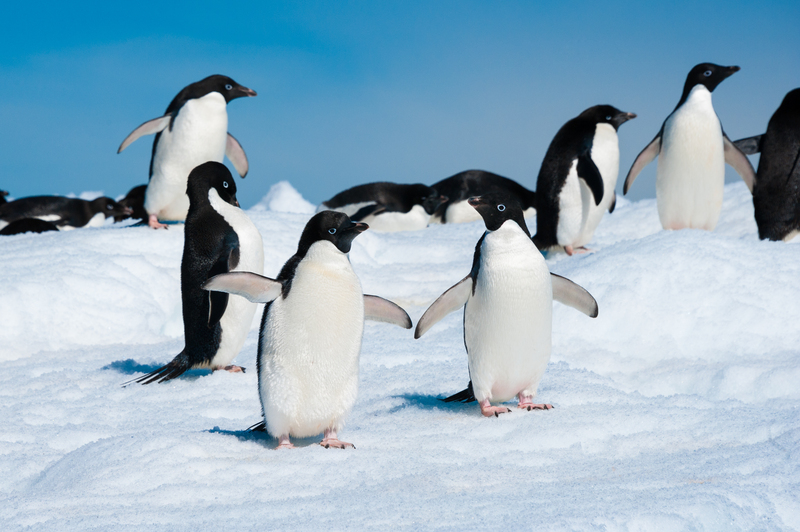 They are less common than many other penguin species with a total population of about 300,000 breeding pairs. Gentoos prefer life slightly warmer than the Adelies and although they can be found on Antarctica itself, they mainly confine themselves to the Antarctic Peninsula – which is slightly further north than the rest of the continent. They are also present on most sub-Antarctic islands, such as South Georgia, The Falkland Islands and Macquarie Island. 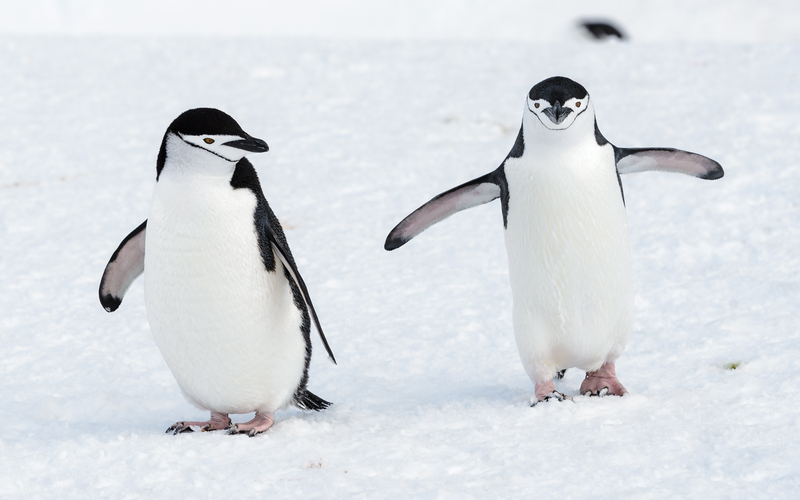 Chinstrap Penguin: Similar in size to the Adelie and although they look quite different they are often confused with the Adelie, purely because they are a similar size and almost entirely black and white. The Chinstrap is the second most common species with over 7.5 million breeding pairs, although it should be noted that almost 5 million of them are on the little visited South Sandwich Islands. Chinstraps are mostly concentrated around the Antarctica Peninsula and nearby islands (like the South Sandwich Islands) and therefore are very common to see on the Antarctic Peninsula. 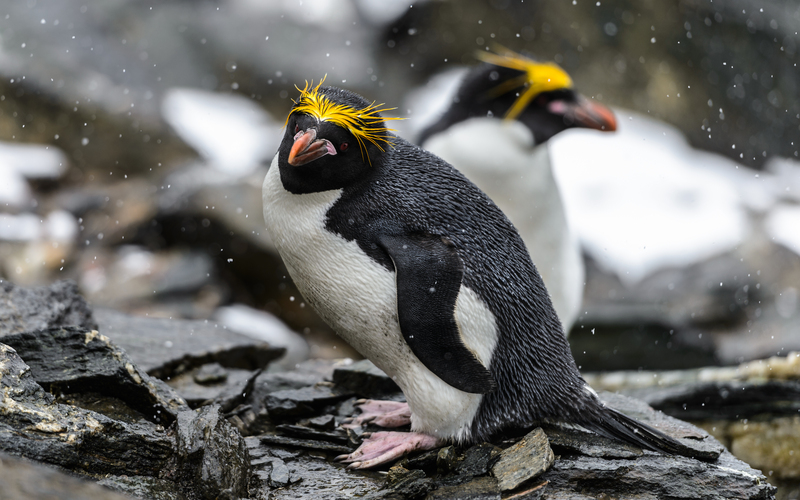 Macaroni Penguin: Part of the crested family of penguins, along with the Rockhopper and Royal Penguins. They have a yellow crest on the top of their heads, and black faces. The Macaroni Penguins are the most common penguin species of all with an excess of 11 million breeding pairs. That doesn’t mean that they are easy to see – many of the largest colonies are on very remote sub-Antarctic Islands such as Isles Crozet, Isles Kergeulen and Heard Island. These islands very rarely have cruise ships visiting them. It’s unlikely that they would be seen on a standard Antarctic Peninsula Cruise as they mostly restrict themselves to sub-Antarctic islands. Fortunately they do have large colonies on South Georgia. Rockhopper Penguin: Another of the creasted penguin species, the Rockhopper is smaller than the Macaroni but is very difficult to distinguish from a macaroni in photos. 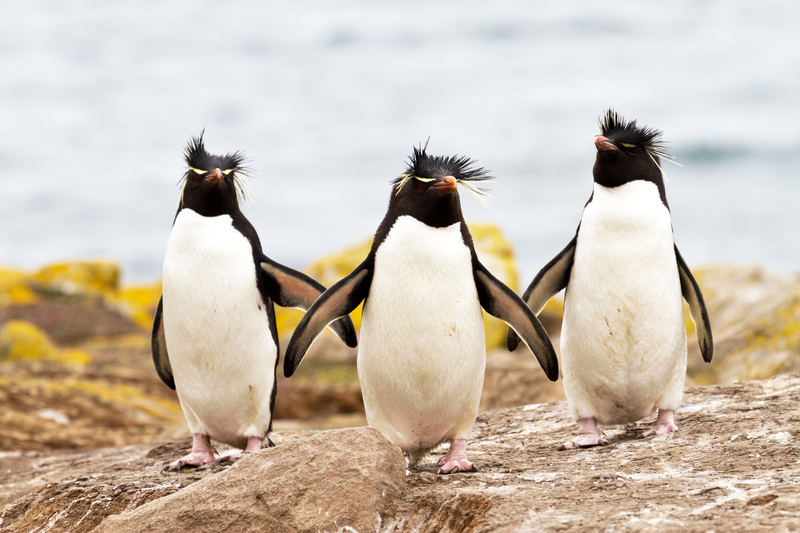 The easiest way to differentiate them is that the rockhopper’s crests do not meet on the top of its head, whereas the Macaroni’s does. The Rockhoppers are one of the more common penguins with over 3.5 million breeding pairs, but again these penguins are mostly confined to sub-Antarctic Islands. The biggest colonies are on the Falkland Islands. Difficulty to see (3/5) relatively easy provided you take a Falklands, South Georgia and Antarctica Cruise. Can also be seen in the New Zealand sub Antarctic Islands. Royal Penguin: The last of the crested penguins to be mentioned. 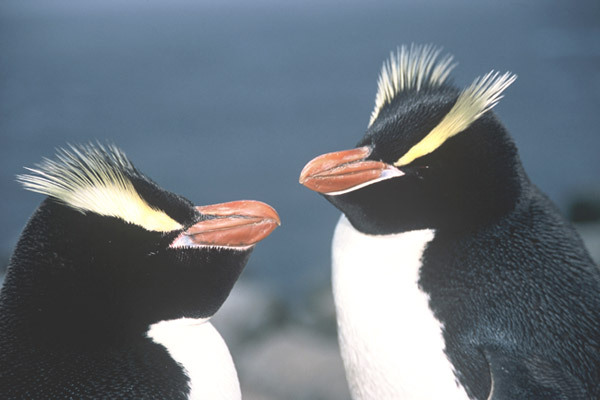 This close relative of the Rockhopper and Macaroni Penguins can only be seen on Macquarie Island. Its entire population of 2-3 million birds live on Macquarie Island. Difficulty to see (4/5). While you are guaranteed to see them if you go to Macquarie island it is a lot of money to spend and a long way to travel. Antarctic Peninsula Cruises (ex Ushuaia, Argentina): Generally 10-12 days in duration and prices start from around US$6000. Fly cruises (flight to the South Shetlands and then cruise) can be done from 5 days too but are more expensive. Likely to see: Gentoo, Adelie and Chinstrap. Potentially see King and Macaroni. Likely haul: 3-4 penguin species. Antarctic Peninsula Cruises including South Georgia and the Falklands (ex Ushuaia, Argentina): Typically 18-20 day cruises starting around US$12,000. Likely to see: Gentoo, Adelie, Chinstrap, King, Macaroni and Rockhopper. Likely haul: 6 penguin species. Weddell Sea Antarctic Peninsula Cruises: Very similar to the standard Peninsula cruises in terms of penguin species, although it should be noted that there is an Emperor Penguin colony on Snow Hill Island in the Weddell Sea. Be very careful if picking a Weddell Sea cruise as not all ships plan to visit Snow Hill Island and even if they do, you may not be able to see the Emperors owing to the fact that their rookeries are inland. The best chance is taking a ship with a helicopter which intends to use it to get closer to the Emperor Penguins, although there are very few ships that have the capacity for this. East Antarctica or Ross Sea Cruises (ex Bluff, NZ or Hobart, Australia): These much longer and much more expensive cruises (typically over 25 days) take a lot of “sea time” given the long distances from Australia and New Zealand to East Antarctica and/or the Ross Sea. 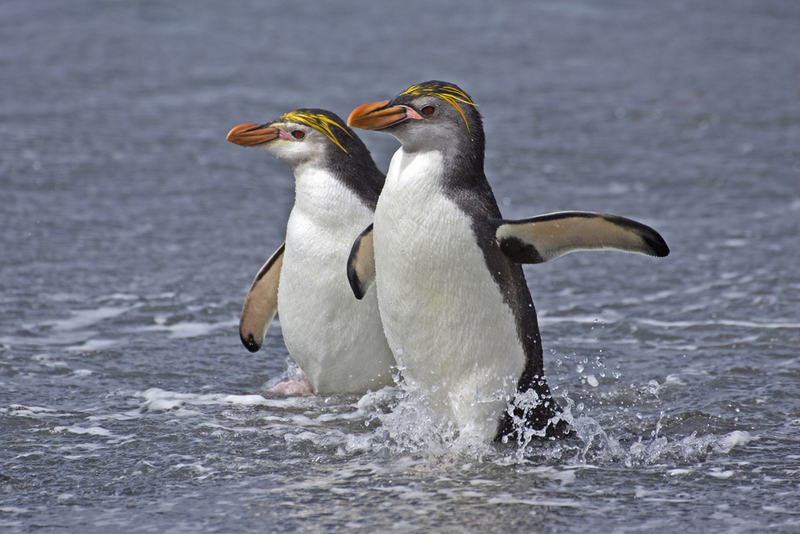 Most cruises will stop at Macquarie Island, which ticks the Royal Penguin off the list. Emperor Penguins are also much more likely although by no means certain. 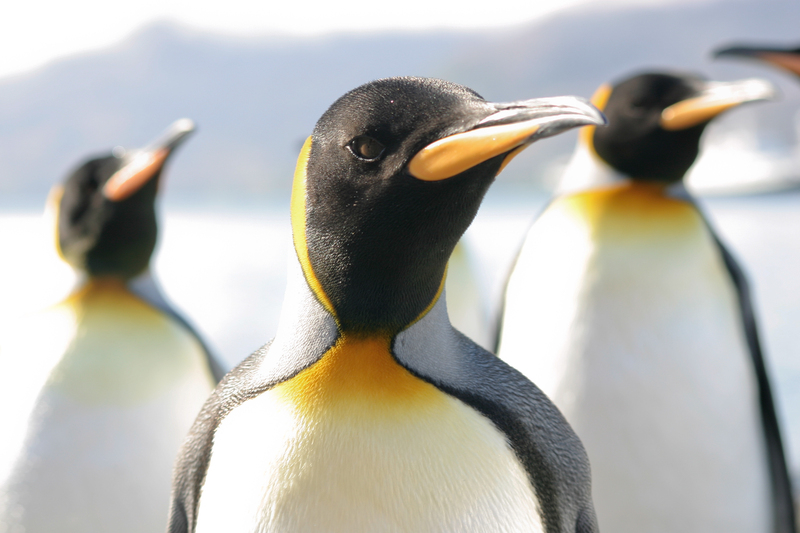 King Penguins, Gentoos, Adelies and Rockhoppers are also very likely. Only the Chinstrap and Macaroni penguin is unlikely to be seen. Erect Crested Penguin. Photo credit: Terra Nature. Erect Crested Penguin: This crested penguin is endemic to two small New Zealand Islands: Bounty and Antipodes Islands. 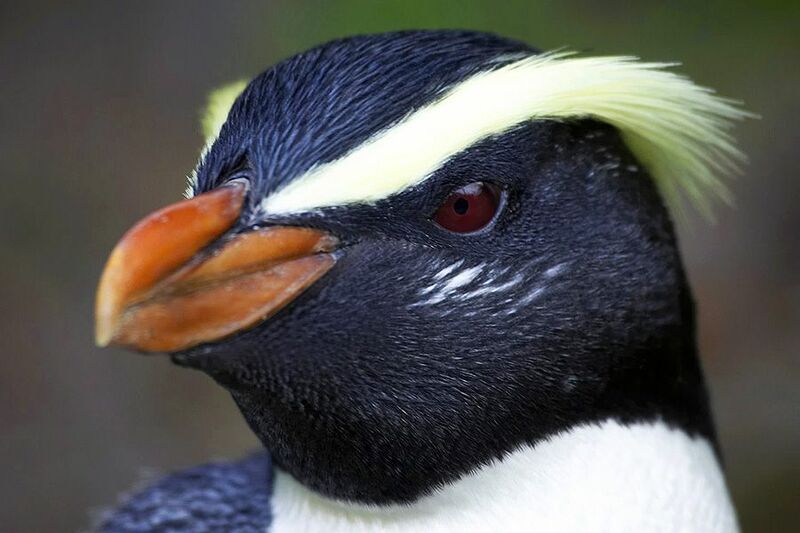 It is a medium sized crested Penguin and has a distinctive bright yellow stripe crest directly over its eyes. With a breeding population of only 150,000 pairs it certainly isn’t one of the most populous species. Possibly because of its limited breeding areas the population is unfortunately in decline. Not a lot is known about the Erect Crested Penguins, but they do breed on rocky slopes and only sometimes build a nest. Difficulty to see: (3/5) relatively easy provided you take a specialised cruise departure to the islands. There are normally 2-3 departures every Southern Hemisphere summer from Bluff, New Zealand. Yellow Eyed Penguins: These crested penguins have distinctive yellow eyes, as their name would suggest. They are found on the South Island of New Zealand and some of New Zealand’s smaller southern Islands such as Stewart Island, Campbell Islands and Auckland Islands. The Yellow Eyed Penguin is one of the rarest Penguin species in the world with only approximately 4000 breeding pairs. It is also thought to be one of the most ancient penguin species. Unlike most other penguin species the Yellow Eyed Penguins do not generally nest within sight of each other. They may come ashore in groups but then disperse into bushland to set up nests in pairs. Difficulty to see: (2/5) Despite these penguins nesting on the New Zealand mainland the limited number of Penguins and unique breeding habit means that they aren’t particularly easy to find. 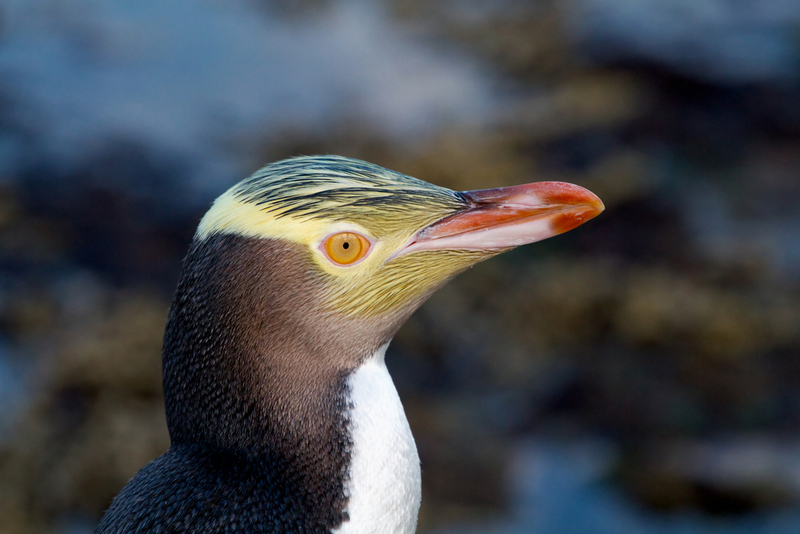 There are tours in Dunedin, NZ but to see in more detail there are also specialised departures to the Auckland and Campbell Islands where there is a chance of seeing Yellow Eyed Penguins. There are generally 2-3 departures every Southern Hemisphere summer from Bluff, New Zealand. Fiordland Penguin. Photo credit: Birding New Zealand. Fiordland Penguins: Another crested penguin which looks very similar to the erect crested penguin. Its main point of differentiation is the small white lines under their eyes. As its name suggests these penguins mainly breed in the Fiordland region of New Zealand and they are endemic to New Zealand. Fiordland Penguins are considered to be very rare although accurate population numbers are not known. Difficulty to see: (1/5) Despite these penguins nesting on the New Zealand mainland the limited number of penguins and unique breeding habit means that they always easy to find. That said viewing sites such as Munroe Beach, South Westland on the New Zealand mainland are reasonably reliable. Probably the easiest Penguin to see in NZ. Snares Crested Penguins: Endemic only to the Snares Islands which are a small island group south of New Zealand’s South Island. The penguin looks very similar to the other New Zealand crested penguins although its yellow crests droop towards the back more like a Macaroni Penguin. Populations are healthy on the Snares. Difficulty to see: (3/5) Relatively easy provided you take a specialised cruise departure to the Snares. There are normally 2-3 departures every Southern Hemisphere summer from Bluff, New Zealand. Fairy Penguin (otherwise known as the Blue Penguin or Little Penguin): Endemic to New Zealand and parts of the Southern Coast of Australia, this is the world’s smallest Penguin, weighing in at just over 1kg. 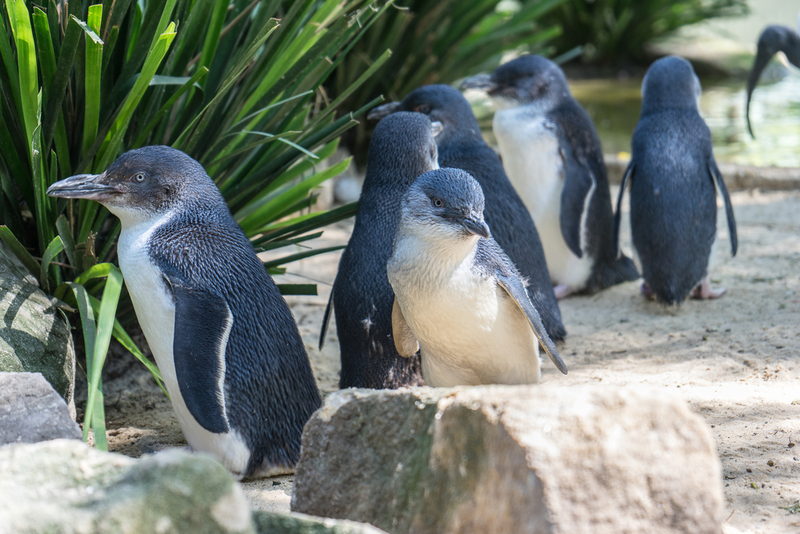 In New Zealand they are generally called Blue Penguins and in Australia they are known as Fairy Penguins or Little Penguins. The juveniles have a distinctive blue back, hence the New Zealand name for the bird. When breeding they only come ashore at night, leaving early in the morning. Difficulty to see: (1/5) Very easy as they can be seen on mainland Australia and New Zealand and many tour agencies in both countries offer tours to breeding sites. Magellanic Penguin: This penguin is endemic to Southern Patagonia in South America. It has a distinctive black and white patchy face overlayed by a light pink blush. 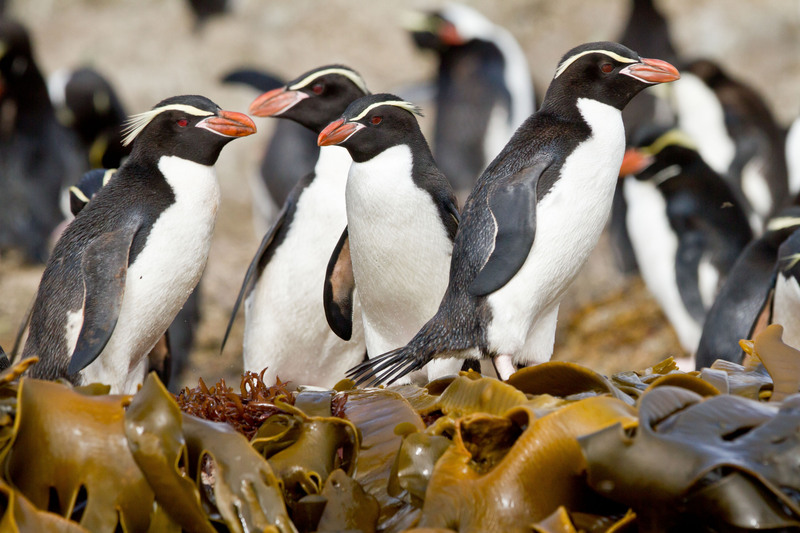 As the name suggests these penguins are most common around the Magellan Strait area in Southern Patagonia. Difficulty to see: (1/5) Very easy as they can be seen on mainland South America. There is a penguin colony near the Chilean town of Punta Arenas and this colony can be visited on a day trip from the town. Galapagos Penguin: Endemic to the Galapagos Islands, and the only Penguin species which exists north of the equator (and even then only just as the Galapagos Islands sit more or less on the equator). The Galapagos Islands are a short flight out into the Pacific Ocean from Ecuador. The Galapagos Islands is one of the world’s greatest wildlife viewing destinations, especially for its marine life. The Galapagos Penguins are no widespread in the Galapagos and their largest breeding sites are in are the small passage between Isabella and Fernandina Islands. These are Galapagos Cruises that can be organised to Fernandina and Isabella Islands. 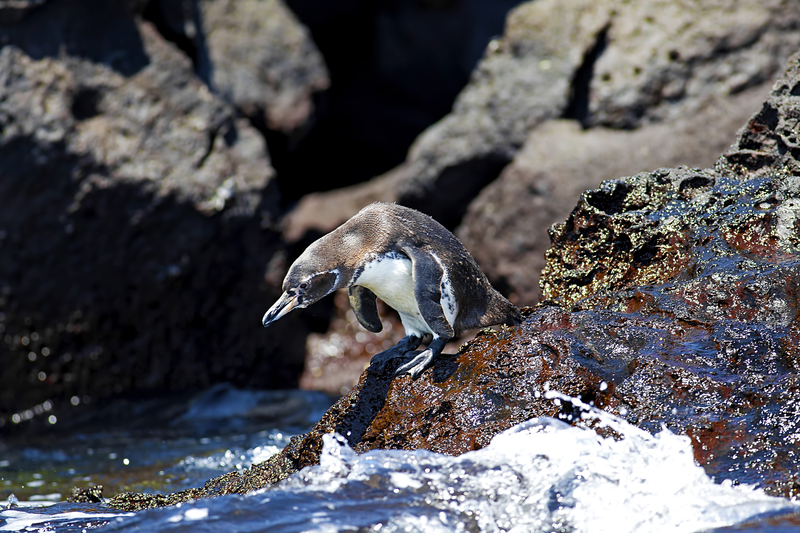 The Galapagos Penguin is also one of the few Penguin species which can easily be swam with, owing to the fact that it’s one of the few penguin species that lives in reasonably temperate water. Difficulty to see: (3/5) Relatively easy provided the right Galapagos cruise is chosen. The Galapagos Islands is one of South America’s more expensive destinations and as the penguins are mostly located in the more remote islands be prepared to do a cruise of at least 1 week in duration. Humboldt Penguin: Very closely related to the Magellanic Penguin of Patagonian South America and in fact some of their breeding areas overlap. The Humboldt Penguin is restricted to the western coast of Patagonia and unlike the Magellanic Penguin its range extends up the coast of South America into the coastal areas of Peru. 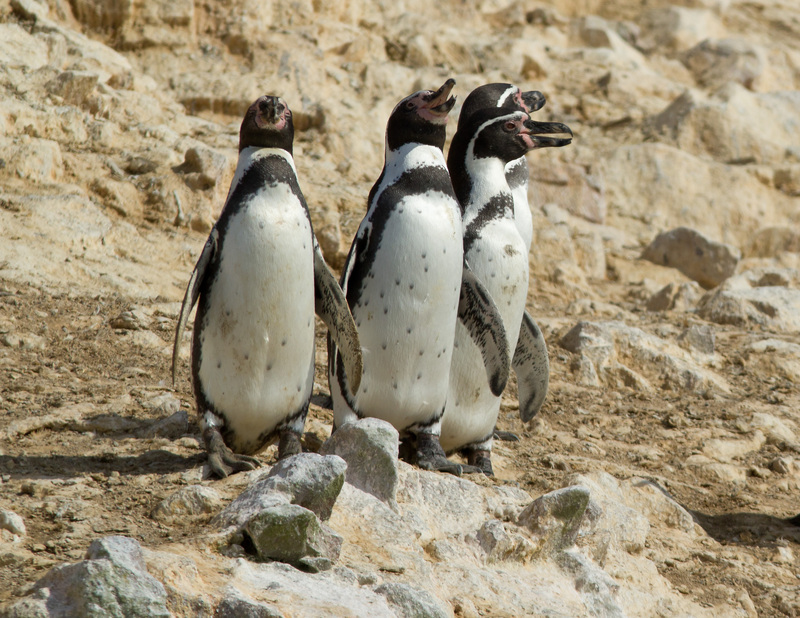 The main difference between the Humboldt Penguin and the Magellanic is the more prominent reddish colour. Difficulty to see: (2/5) Relatively easy provided you have a knowledgeable guide who can take you to their breeding grounds in Peru or Chile. The three islands of Chañaral, Damas and Choros in Northern Chiles are a good place to try. 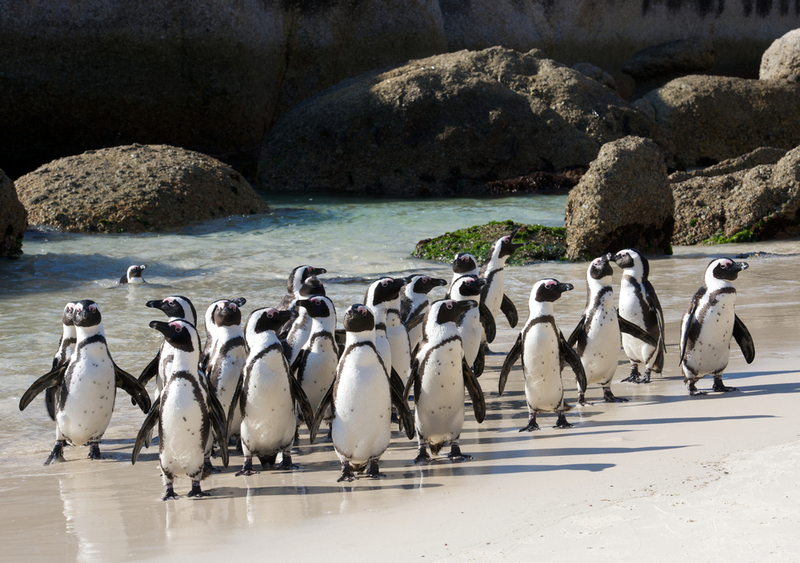 Jackass Penguins in South Africa. Jackass Penguin: Restricted to the coastal areas within 50km of South Africa, this is the only Penguin found in South Africa, and it only breeds in South Africa. Once numerous, the population numbers have fallen significantly in recent decades. The penguin looks roughly similar to the Magellanic Penguin or Humboldt Penguin. Difficulty to see: Difficulty to see: (2/5) Relatively easy provided you have a knowledgeable guide who can take you to their breeding grounds in South Africa. Organised tours can be booked in Cape Town. 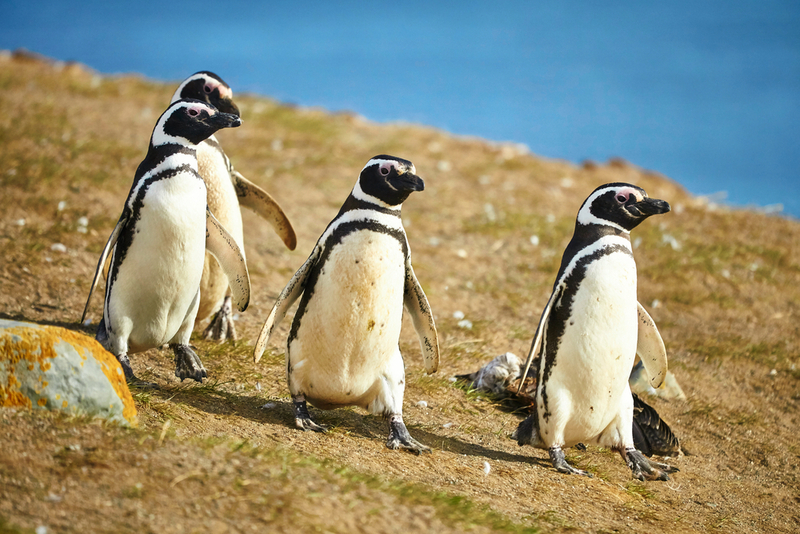 Chimu Adventures’ wide range of tours within South America and Antarctica and sub-Antarctic Island expedition cruises mean that we can get you on tours and cruises to the breeding areas of all of the world’s penguin species. Contact us for more details. The most popular tour itinerary to Antarctica. Cruise to all of the must-see Antarctic destinations.